The 119th Edition of the Carnival of Genealogy is a return to the "Swimsuit Issue"
The topic for the next edition of the Carnival of Genealogy will be: The 5th Annual Swimsuit Edition! Yes folks, it's that time again. It's time to think of summer and lazy days spent at the pool or beach. 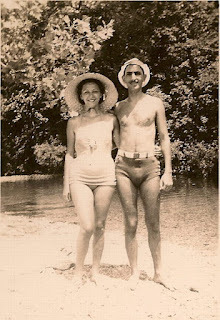 Dig out those wonderful swimsuit pictures of days gone by and share them with us! Here's my 2008 2009 and 2011 contributions to this theme. Below are my grandparents, Melvin and Sissie (Feinstein) Newmark - 75 years ago - celebrating their honeymoon in 1937. As far as their family was aware, they were married in January of 1937. 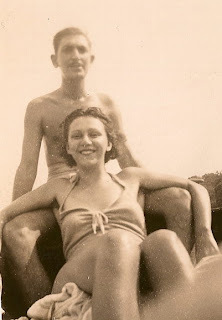 However, they were actually married in May of 1936. I'm not exactly certain when their honeymoon took place, but it was after the second ceremony. Such sultry swimsuits! Welcome back from Europe! Wonderful pics John! Thanks for sharing them in the COG! Those are great picture and wonderful memories!